I adore an outdoor pool as much as anyone, but these days it takes something special to stand out from the crowd. Lois Avery is all about highlighting the magical moments that Italy has to offer. You know, the dreamy I-must-go-there-right-now experiences that the Italians do so exceptionally well—the real Italy—not the touristy version you see so frequently. And through some extensive research (someone has to do it), I’ve learned that not all pools are created equal. I’ve seen some pretty spectacular ones—like those that appear to be floating on lakes—but not even they can compare to the five secret pools I’m going to share with you today. Before I dive in (pun intended), you may be wondering how I decided which ones to include on this list. It’s really very simple. I went looking for pools you can hide by on a hot summer’s day. Pools that make the hotel instead of the other way around. But most importantly, I looked for destinations that created an experience that felt like Lois Avery. This means that by visiting one (or all) of these hotels with pools you’ll connect with the people, places, food and, of course, the “real” Italy. Which I think is the true purpose of going to such a magnificent place, don’t you? So, promise not to tell anyone, OK? Here are my five favourite secret Italian swimming pools this summer. The pool of Le Capase showcases what visiting the Adriatic Coast is all about—endless sea views. The pool is carved into the side of a cliff and offers some of the most breathtaking views in Italy. It’s also a very small and private resort so you’ll feel like you have the entire place to yourself. Its low key and rustic splendour will captivate you—I guarantee it. 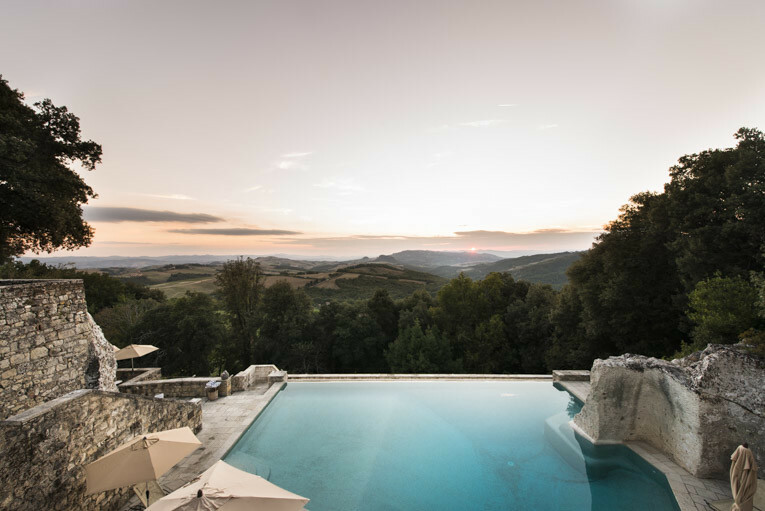 Have you ever wondered what it would feel like to be nestled into the Chianti countryside in the heart of Tuscany? If so, then I’ve found the optimal spot for you. And with the perfect pools (yes, there’s two!) to splash around in no less. You’ll find this oasis—La Palagina—tucked away in the middle of a vineyard, but still only eight miles from the gorgeous town of Greve. I’ve been stalking this hotel online for years. The photos of guests sunbathing on the rocks under white umbrellas are capitvating, but it’s the beautiful pool hidden in the trees with stunning views of the sea that pulls me in. Casa Privata is hidden away in a rambling garden, yet still surrounded by views of Praiano on the Amalfi Coast. It’s more of a stylish home than a hotel, which I absolutely love. Would Audrey Hepburn have lounged by this pool? Absolutely! Capri is hardly a secret, but what if you could enjoy the Faraglioni rock formations from your swimming pool... without the crowds? Punta Tragara started its life as a private villa and was later converted to a hotel, which I think helps provide a sense of intimacy. And who doesn’t like that? Also, can you imagine the sunsets from this pool? Pass me an Aperol Spritz! The website describes Borgo Pignano as “Tuscan heaven” and they definitely are not wrong. Deep in the countryside, there is an infinity pool built into a quarry with views of the endless rolling hills. What more do you need? 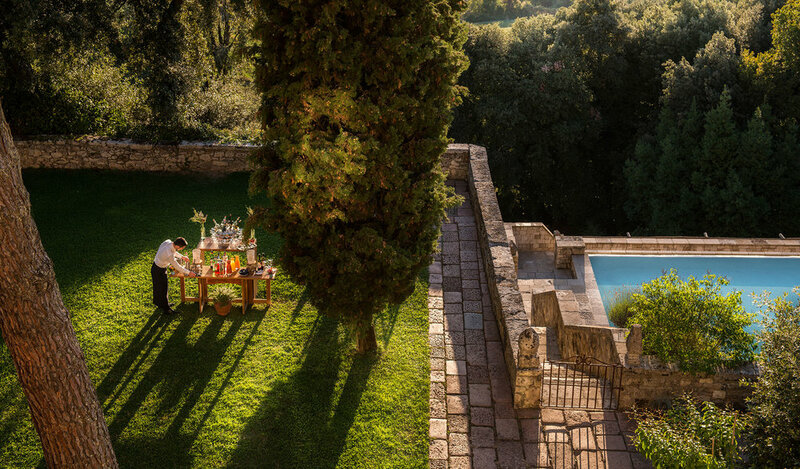 You’ll find the pool tucked right next to the exquisite 18th-century villa that is now the hotel. And if you must leave your sun lounger by the pool, then I suggest a visit to San Gimignano and its 14 medieval towers. Well, the secrets are officially out! All that’s left to do is pack your Lois Avery shawl and hangout poolside.